Traveling during the holidays can be tough. Traveling with kids can be tougher. Combine the two, and you have a recipe for disaster. Or do you? Check out some of our favorite tips to help make your holiday travels smooth sailing. 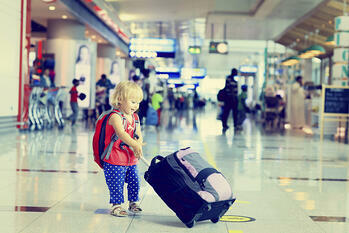 Help your child pack their carry-on or, at the very least, inspect their bags. It should contain enough items to keep them entertained on the flight, but not to the point where they can’t carry it themselves. Navigating an airport with kids is tough enough without having to keep track of 4 or 5 bags. Double check those bags before walking out the door to make sure your child isn’t trying to smuggle anything unnecessary (or not allowed) at the last minute. Print your boarding pass at home and check in your bags online. The less time you have to wait in lines, the less likely you are to have a cranky child once you finally board your plane. We all know to arrive early for our flight, but this becomes even more important during the busy holiday season. Add at least an hour to your usual airport arrival time during the holidays. For domestic flights, arrive at least two hours early and for international, plan on about three. You cannot push your stroller or take a car seat with a child inside through the metal detector. Start preparing before you reach the security checkpoint to make the transition as smooth and quick as possible. However, you can use a carrier to transport your child through security. You may have to spend time going through extra checks, but you won’t have to transfer your baby. As a reminder, you may not bring wrapped gifts through security, they will be opened. Ship any gifts directly to their destination or pack them in your checked baggage. Let the kids document the trip from their point of view. Bring along a kid friendly camera and a notebook to write things down if they are older. This gives them something to do and also helps them be observant throughout the traveling process and the trip itself. Have a fully charged tablet or smartphone with activities for them to play. If your kids are older, look for games you can play as group to keep everyone entertained while waiting for your flight to board. When taking off or landing, have your kids either take a drink or chew gum. Babies should be nursing or drinking a bottle to prevent plugged ears. Bring extra clothes. Accidents or other incidents can happen, no matter the age of the child. Also, bring along a plastic bag in case you need to store soiled clothing for the duration of a travel day. Just remember, even if your child spends the entire plane ride screaming and crying, the majority of people will understand. Those who don’t, you’ll likely never see them again, so don't worry about it. Don’t let a bad travel experience ruin a vacation or your outlook on taking your kids on trips.